Monday through Friday, I publish a free daily email newsletter (which you can, and should, sign up for), putting to words the notion that you should – and can – learn something new every day. Oddities, like the fact that Abraham Lincoln created the Secret Service the day he was shot, carrots used to be purple, there is only one Jewish person in all of Afghanistan, etc. It has about 4,000 subscribers. It’s basically a blog, sure, but I send it as an email newsletter. Long story; one for another day. The main costs involved – the costs of writing and editing the email – are fixed costs. (At this point, it’s also entirely a time cost – mine to write it, and a volunteer who very generously edits it before I send it out. But even if I hired writers and editors, the cost of producing the content is, at least in this context, a fixed cost.) Write it once, send it to many – as many as subscribe. It costs the same amount to write the email to one person as it does to one million (God willing!) subscribers. The marginal costs are, relatively speaking, minor, and consist of the fees paid to the email service provider I use, Mailchimp. At the number of emails I send and the number of subscribers I have, it’s about a twentieth of a cent per email, or $0.05 per 1000. Let’s say I can monetize the emails pretty easily at $1 per 1000 (or $1 CPM, as in “cost per mille” from a fictitious advertiser’s perspective), and my margin is 95%. Your blog, twitter account, etc.? It’s probably even better, unless you’re somehow paying on a cost-per-post basis. Let’s say that an average subscriber sticks around for 10 months, and that I publish 20 issues a month. And, while I’m making up pie-in-the-sky numbers, let’s also assume I can get $5.00 CPM from advertisers, on average, over the course of those ten months. The lifetime value of each subscriber? $1. Each subscriber receives 200 emails, and at $5 per 1000, that’s a buck. That LTV – $1 – is my upper limit. Spend any more to get a subscriber and I am losing money with every additional subscriber, and that’s bad news. So while word of mouth, Tweets, Facebook posts, guest blog posts (did I mention you should subscribe to the newsletter? ), etc. are all very good ideas — that’s how I’ve made it to about 4,000 people signed up thus far — are also pretty close to the only viable ways to grow the subscriber base. Other ideas? AdWords or Facebook ads would cost about $0.25 per click to advertise on “learn something new every day,” requiring that I convert a quarter of clicks to subscriptions just to break even – a tall task for email newsletters, akin to getting 25% of visitors to subscribe to your blog’s RSS feed. A lot of list-building (cue ominous scare quotes) “best practices” – co-registration, contests/incentivized signups, etc. – will hurt the CPM level and likely lead to a much lower LTV. And buying lists? No thanks. This inability to turn money into new subscribers, customers, etc. is a huge limit on the speed and potential for growth. Sure, things can break well and the newsletter can grow by itself, via the methods noted above. But those methods are a mix of elbow grease, dumb luck, a solid product, and a lot more of that dumb luck stuff – the hallmarks of the “secret sauce” which somehow, some way turns a hobby into a viable business, in a manner and fashion beyond repetition. 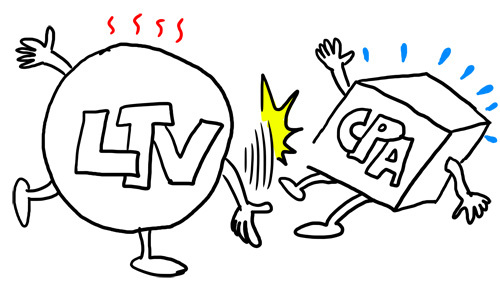 LTV > CPA applies, of course, beyond newsletters and beyond media, digital or otherwise. It’s generally easy to apply, as even estimations based on guesses and conjecture are enough to make sure that you’re not making a huge mistake. After all, it may be a great idea to spend a ton of capital and spend it to grow your customer base, but not if you’re spending more money to get each additional customer than that customer is worth. 1) At LTV=CPA upper limit, people usually miss out a lot of other expenses. Esp. in bigger companies where its harder to find all associated costs, both fixed and variable. 2) Fixed costs/unit goes down as you acquire more users. So your CPA can go down as you scale. 3) Cash flow is not addressed. If you have a 3 yr LTV, you don’t really want to spend all of it today. You’ll run out of money. This article was originally written by Fred Wilson on April 25, 2011 here.